Surface - is the best yet to come? Steve Ballmer has confirmed that Microsoft is working on more hardware beyond the Microsoft Surface. In an interview with the BBC, the Microsoft CEO appeared incredulous that anyone would think otherwise. Ballmer said, "Is it fair to say we're going to do more hardware? Obviously we are. "We did our first piece of non-Xbox hardware when we launched the Surface. Where we see important opportunities to set a new standard, yeah we'll dive in." 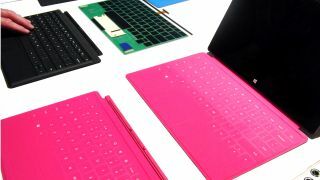 As Microsoft's Windows 8 showcase tablet, the Microsoft Surface Pro will launch soon with full Windows 8 while the consumer version (just Microsoft Surface) comes with the tablet-friendly Windows RT software. Speculation is rife that Microsoft's next device will be a "Surface phone" running the Windows Phone OS. Ballmer didn't comment on the rumours in the interview but he did say that the company is "committed" to its vision and will do "whatever is required from both a hardware and a software perspective" to make it happen. An own-brand smartphone does seem like the next logical step, although the company risks angering its hardware partners by dipping its toe in the mobile waters – particularly former BFF Nokia which was recently shunned in favour of HTC.